The NKJV Large Print Compact Reference Bible is the perfect travel companion for Bible readers on the go. Though it fits easily into backpacks and purses, you won't have to sacrifice readability or study features. The exclusive Thomas Nelson NKJV Comfort Print® typeface provides a smooth reading experience for deeper engagement in God's Word, while the complete cross-references, concordance, and full-color maps provide everything you need for serious study. NKJV, Reference Bible, Compact Large Print, Leathersoft, Pink, Red Letter Edition, Comfort Print by Thomas Nelson was published by Thomas Nelson in June 2018 and is our 64437th best seller. The ISBN for NKJV, Reference Bible, Compact Large Print, Leathersoft, Pink, Red Letter Edition, Comfort Print is 9780785217503. 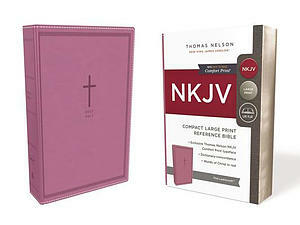 Be the first to review NKJV, Reference Bible, Compact Large Print, Leathersoft, Pink, Red Letter Edition, Comfort Print! Got a question? No problem! Just click here to ask us about NKJV, Reference Bible, Compact Large Print, Leathersoft, Pink, Red Letter Edition, Comfort Print.